Website Note that their site has not been updated for some time, and the menu has changed quite a bit. It had been about 9 months since our last visit to The Burger Kitchen, and I had promised owner, Alan Saffron, a fresh look since they had addressed the issues, which I had brought up during my previous visit. This time I brought in Fat Bruce Lee (back on a diet), so that we could sample a couple of burgers from the extensive menu. On this visit, we had the opportunity to speak with Mr. Saffron at length, and it was a pleasure to get an insider's view of the menu, the kitchen, and the ideas behind the food. I know that some food reviewers prefer not to engage with the establishment, but I found it refreshing. For a burger joint, the menu was deep. Alan Saffron was a bit (lot) of a meat geek, and he created a range of custom and exotic blends in addition to the Standard, Steak, and The Natural blends. There were no less than 6 exotic blends on the new menu. I had to hand it to Mr. Saffron--his stated mission was to serve the best burger ever, and the guy has not given up or ceased innovating. After Jonathon Gold suggested that he switch from Pat La Frieda beef (NYC) to Harvey Guss beef (Los Angeles), Mr. Saffron abandoned his La Frieda fetish and made the switch to the Harvey Guss dry-aged product. During this visit to The Burger Kitchen, Mr. Saffron shared with us his latest innovation, and it was fantastic--more to come in this review about that. It didn't stop there, though. The Burger Kitchen recently brought in Carlos Abayta from 25 Degrees to oversee the kitchen. Also, they are sourcing all of the pastries from David Blaine, and they are considering having him bake the buns rather than sourcing the brioches from Ca' d'Oro bakery in Santa Monica. The Harvey Guss beef was sourced from Harvey Guss Meats and the other beef was sourced from Huntington Meats, just like at The Golden State, and the beef was delivered freshly ground. We ordered a handful of cheeseburgers. Fat Bruce Lee and I decided to go 50/50 on The Natural ($19) and a Standard cheeseburger with White Cheddar ($11). Our burgers arrived in about 10 minutes. The Standard burger patty was 8 ounces of a coarsely ground, custom blend of roughly half Short Rib and half Chuck. This was outstandingly juicy, beefy, and tasted strongly of blood. In fact, this burger led with the blood/iron flavor, and that note carried evenly through the first half of the bite. There was no funk from aging in the Standard blend. This beef was quite good, and the coarse grind and cautious handling allowed the beef to retain its juices. The Natural burger patty was 8 ounces of a coarsely ground, custom blend of Rib-eye, Tri-tip, Brisket, and ..........well, Allan wouldn't divulge all of his secrets. This was the Harvey Guss, dry-aged product, and it was noticeably superior to the Standard blend but not significantly. This bite had a far more steak-like feel to it, and the aging really came through. It was lacking the blood from the Standard blend. Still it was quite good, but the $19 price point was a little higher than I was comfortable with. This, too, was a very juicy burger. The Seasoning: In both cases, the seasoning was applied to gently. The exterior and interior were both lightly seasoned, but the beef was fresh enough and flavorful enough to warrant a heavier hand in this case. The Sear: The sear was quite competent in both cases. 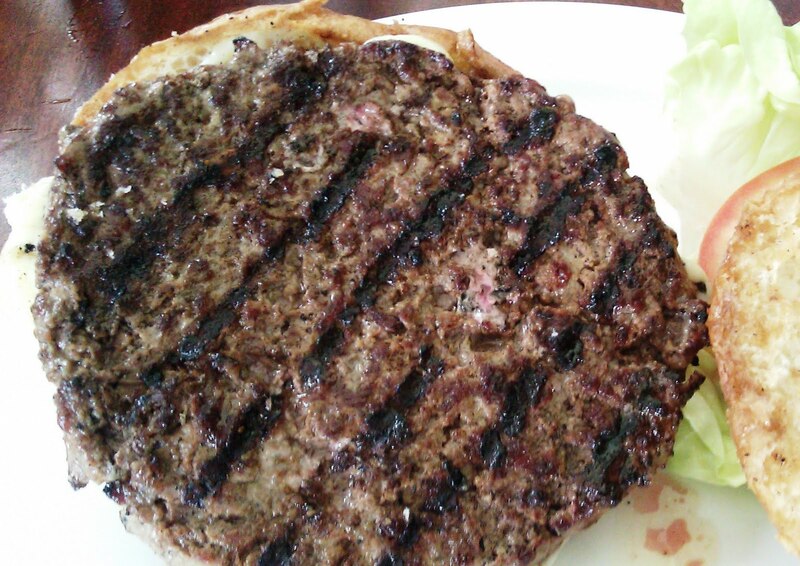 The Burger Kitchen uses both the griddle and the grill to apply the sear. That was damn smart. The griddle applied an even sear, and then the grill deepened it and forced out the moisture to give it crunch. This was especially evident in the next version of the burger, which they were planning to start serving. The sear on that was EPIC. Finally, the sear provided just the right amount of carbon from the hint of char. The Preparation: They really got it at The Burger Kitchen. They used freshly ground cuts of quality beef, and they didn't abuse it. The hand-formed patties were thick and gently handled. The grind was satisfyingly coarse, and the cooking method was inventive, smart, and highly effective. The blackened griddle looked about as hot as a reactor meltdown...like it was supposed to be. They nailed the cooking temperature requests. The Cheese: Both burgers arrived with White Cheddar. This was just fine. 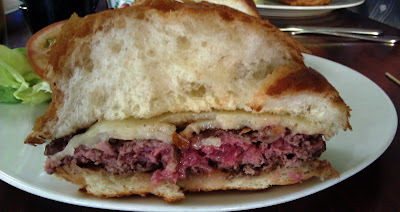 The Cheddar was salty; it melted properly; it provided just enough bounce to make its presence known in the bite while competing with the firm beef for attention. I would love to see them offer an American cheese option at some point. The Bun: The Ca' d'Oro brioche looked like a monster, but it was tender, moist, sweet and just resilient enough to handle the heft and the juice without adding undue denseness to the bite. The sole complaint was that the brioche was brushed with oil, and this made for a greasy feel in the hand and on the lips. There was enough fat in the burgers that this was not a welcome addition to the dish. It will be interesting to see what sort of buns David Blaine comes up with in the future to pair with the patties at The Burger Kitchen. The Fries and Rings: While $3.50 was a little steep for fries or rings, the par-cooked sweet potato and standard fries were crisp and delicious with just enough seasoning. The rings were cooked in a slightly sweet fish and chips-style batter, and these were terrific, as well. The Value: 11 bucks for an 8-ounce burger of very high quality....not bad at all. The New Burger: At the end of the meal, Alan Saffron brought out his latest burger creation. I had mentioned to him that the beef in his burgers would benefit from some added punch from additional spices. What he came out with was a 1/2 pound patty of The Natural Blend, but this time it came out with a sear that was nearly unbelievable. Also, he infused the beef with a gentle touch of mesquite. That did the trick. The mesquite suffused the bite with a mellowness that completely changed the burger. That burger was the clear winner. ****This patty is now served every day at The Burger Kitchen**** The sear was remarkably thick and crunchy without being burned. The Burger Kitchen continues to evolve and steadily improve. 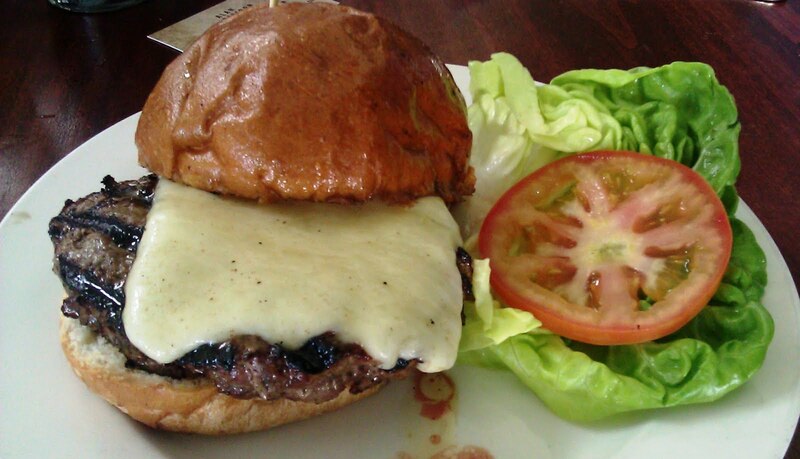 We look forward to seeing them achieve their goal of serving the best burger in LA. Burger Review : The Burger Kitchen served up high quality burger with the goal of serving up higher quality burgers as they mature. Yeah, agreed with above, it does not look appetizing. After seeing how the owners act on the "Kitchen Nightmares" show, I'd certainly prefer to spend my money at a restaurant where the owners are actually appreciative of their customers feedback....i.e. a good restaurant ;). If i wanted smooshy cheaply made junk id go to a fast food place, at least my food would be FAST and HOT. In my opion, you should try eating there again after seeing the kitchen nightmeres show. We did..that review is elsewhere on the site. Sadly, the burger was not great.